We just started sto cking a few manual folder knives. This is a nice value knife that is a manual folder. 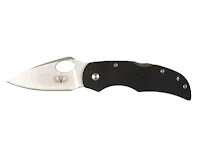 This is a sturdy lockback knife with a clip point. It has an extremely light G-10 handle (G-10, if you don’t already know, is an epoxy filled with woven glass fiber composite. It is generally used for it’s lightweight strength and the ability to handle extreme temperatures and shun chemicals.) This knife is surprisingly durable. When it first came in, we took it out and subjected our “test subject” to a variety of stress tests. It survived the challenges we put it against with flying colors. This knife also has an oval hole in the blade. This makes it so you can open it one handed. It starts out pretty stiff. You need a strong finger t o open it one handed, but after a few weeks carry it seems to be a little easier to open. Another nice feature of this knife is that it has a curved clip which sits it a little lower in your pocket. Finally, it has a parachute surrounded by wings etched into the blade–a nice touch. I like the knife quite a bit. 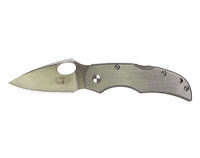 The stats are as follows—Blade: 2.5″Overall: 6.”Closed: 3.5″Weight: 2.04 oz. For an inexpensive folder, it is a deal. At just $18.99 it is a steal of a deal. You can add one to your collection without doing major damage to your pocketbook. You can also get it in stainless steel although the stainless version weighs in just a bit heavier. It weighs in at 3.35 oz. The stainless version is priced the same. Check them out, if you have been looking for a nice, value folder that is sturdy, you have just found it.